Laurie here from Stamping Up North, back with another project to share with you this Friday. Today I have a card and tag set, made with matching buffalo plaid paper and Tutti Designs dies. Buffalo plaid is SO trendy and popular again this Christmas! I see it everywhere, and LOVE it. I thought it would be fun to make some Tutti projects with it. 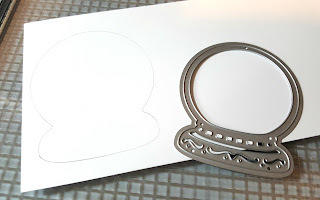 I started out making the card first, by cutting out an embossed stitched rectangle. 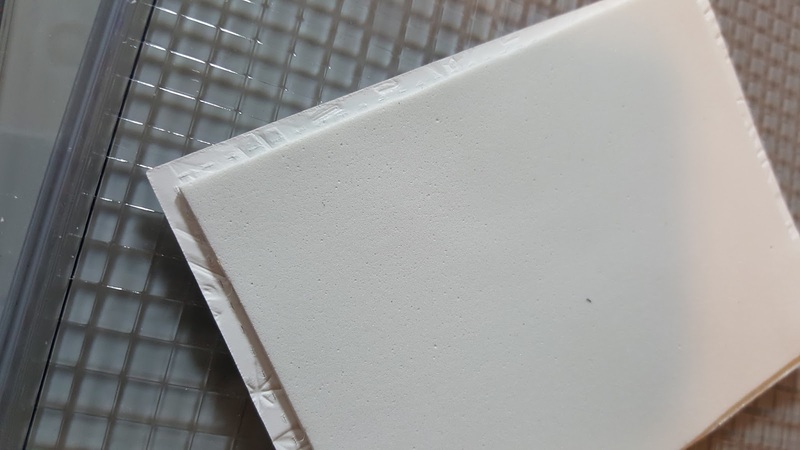 I like to add dimension by cutting out some foam just a bit smaller then the rectangle and adhering it to the back. I like this better than squares or tape, as it lays so nice and flat. Then I cut out 3 trees from the The Gifts Under the Tree die, in red, black and buffalo plaid. I cut off the presents at the bottom,and the stars at the top of the red and black trees. Then I layered them all together before adhering them onto my embossed background. 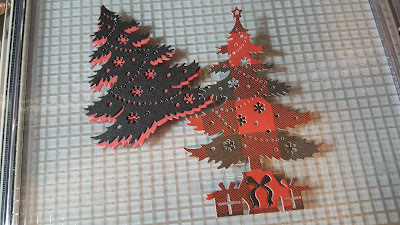 The tiny snowflakes are from the tree...I inlaid the black ones onto the buffalo plaid tree, and the others I adhered randomly around the card. The sentiment is cut out 3 times in white, from the Snowglobe Expressions set and adhered together for added dimension. I also added some tiny pearls. 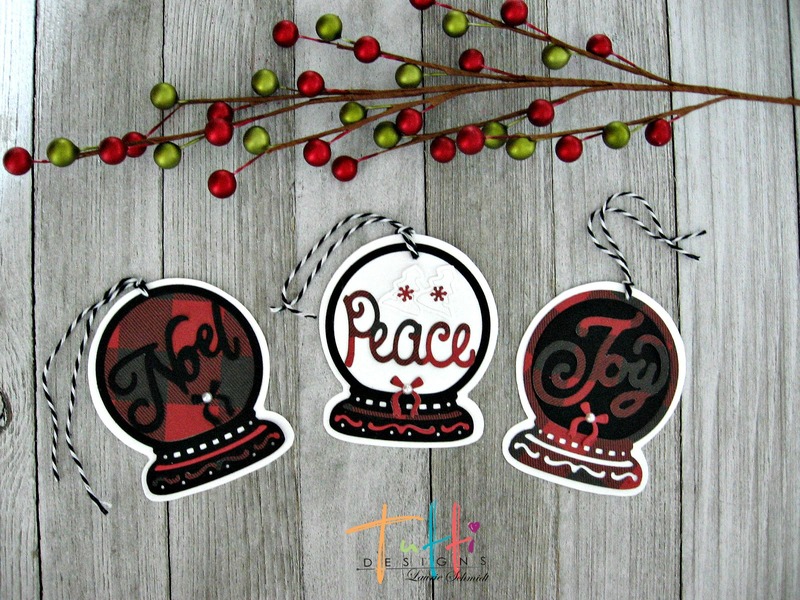 Using the same paper and Snowglobe Expressions set, I made a trio of matching tags. I traced around the die, then cut them out to use for my base. Then I cut out the sentiments and snow globes in red, black and buffalo plaid. I also used some of the snowflakes and bows from the The Gifts Under the Tree die,and some tiny white trees from the Snow Globe Scene die. Then I punched a hole at the top, and tied on some bakers twine. I had so much fun making these cute tags, and I can hardly wait to use them! I'll be back next Friday with a Winter Snow Globe Scene card, I hope you will stop by to check it out! WOWZA! These are AWESOME! 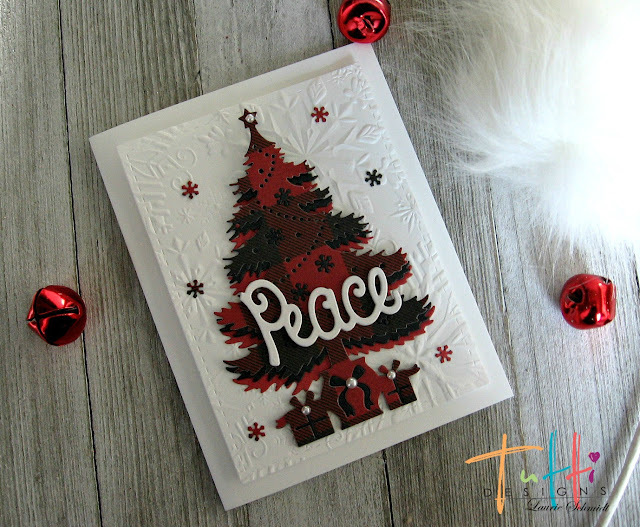 LOVE the card ... what a beautiful design! And the tags are precious ... just perfect! Thanks for amazing inspiration ... well done!!! 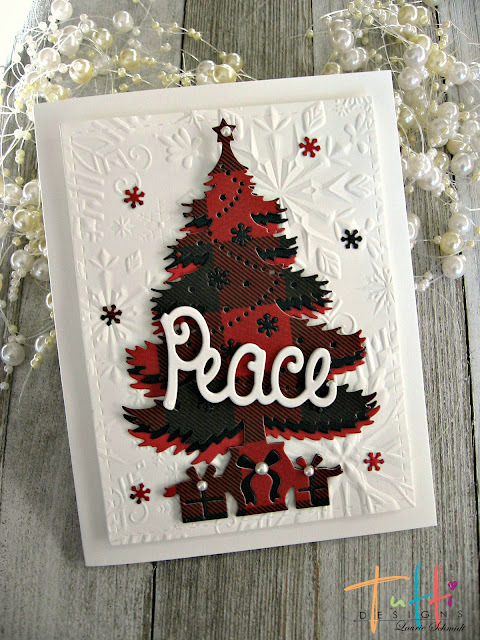 Fantastic card and tags, Laurie! Wow, I love the dimension and Buffalo plaid paper that you used for your tree. The embossed background is amazing too! Oh that is super pretty and really pops against the white. Your little tags are just adorable Laurie! Amazing, and wow factor for sure, love the globes and the tree is amazing. In aww of it. Way to go! WOWZERS! I love the plaid!